David Shen, chairman and CEO of Taiwan-based Hota Industrial Mfg. Co., Ltd., one of the largest precision auto transmission component makers by size in the global market, confirmed that the company has just won new contract orders for reduction gearboxes from two automobile tycoons in Europe and the U.S., to further pump up its revenues and profits in the coming few years. Responding to the trend for electric vehicles (EVs), ever more global carmakers have set up their mass production schedules for such vehicles to meet market demands and regulations in different countries of the world. For instance, Ford, an American multinational automaker headquartered in Dearborn, Michigan, has announced to launch 40 different models of EVs in the next three years, while Toyota Motor Corporation, the world's top-2 carmaker by global market shares and headquartered in Aichi Prefecture, Japan, plans to achieve total EV production of 1.5 million units with its numerous manufacturing bases worldwide in the short term. In the coming two to three years, a new round of competition among global automakers in the segment for EVs will kick off and get much fiercer for sure. In the face of the fast growing but increasingly competitive market segment, Shen said that Hota has poured considerable resources into R&D of transmission systems for EVs over the decade, and earned a solid reputation as a reliable partner in the line. Therefore, the firm is confident to outperform its peers in the competition. Being attracted by Hota's seasoned experience and high quality, some carmakers in Western countries and China have actively sought cooperation with the firm; while two globally leading ones have placed contract orders directly with Hota. It is reported that the two automobile tycoons that have ordered EV parts from Hota are BMW, a German multinational automotive manufacturing company, and Ford. While Hota declines to comment on more details about the new customers, industry insiders generally opine that the addition of the two new automobile makers to Hota's customer list will enable the company to reduce its dependence on Tesla, an American electric auto maker, energy storage company based in Palo Alto, California. Some market observers feel that as more and more carmakers in the world have geared up for production of EVs for now, such vehicles will likely replace traditional cars with combustion engines within three years. At present, EV parts contribute around 20 percent to Hota's total profits, and the contribution rate is estimated to mount to 30 to 40 percent in the near future. According to schedules from several automobile makers, their mass production for EVs will begin continually between the fourth season of 2019 and the second season of 2020. To prepare for the booms, many of EV parts makers, including Hota, have been busy obtaining certifications from their customers. At a time when ever more peers are trying to venture into the lucrative market segment for EV parts, Hota, which is allegedly the only transmission system maker capable of mass producing corresponding components and parts for EVs, is widely regarded as one of only a few firms to win more new orders for such products in the coming six months. 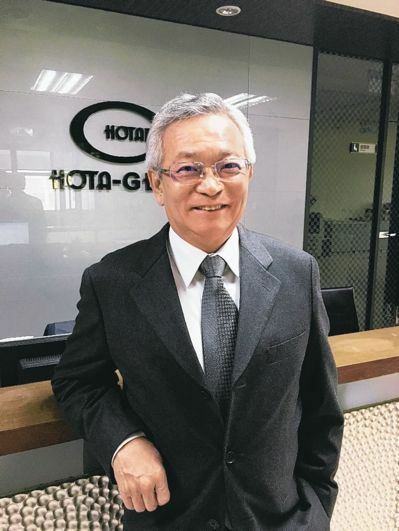 David Shen, chairman and CEO of Hota (photo provided by EDN.com).